I discovered Moonstone when I bought it online. it was set in a ring and I instantly fell in love. Now, I use it in the jewelry I make whenever I can. Moonstone is a very powerful stone. According to Crystal Vaults, Moonstone is traditionally thought to lose its silvery luster if the owner continues to hold onto anger. In the Orient, the Moonstone was known as a “phenomenal gem” that should be worn on Mondays. Scott Cunningham writes that the mythical deities associated with Moonstone are Diana, Seline, Isis, and all Luna Goddesses. He notes that, according to legend, Moonstone is more potent during a waxing moon and less in the waning moon. Moonstone is receptive and draws love, and you can wear it or simply carry it. Moonstone seems to have a lot to do with romance and relationships, according to Cunningham. On the night of the Full Moon one can ring a pink candle with Moonstone cabs. Light the candle and imagine the self in a loving relationship. Moonstone is known for its’ ability to work out problems between lovers, especially when the couple has had a bitter argument. One can hold Moonstone, empower it with loving vibrations and give it to a lover. One can share this ritual with a partner by exchanging stones. The book Love is in the Earth by Melody, discusses the general properties of Moonstone as being balancing. It brings introspection and helps one to be reflective. The stone is for hoping and wishing. It is interesting to note that this stone does help to make wishes come true, however it often brings us what we need and not necessarily what we want. Moonstone allows us to recognize ups and downs and to know that they will indeed come, but that it is all part of the changing cycles of life. It helps us to comprehend the true nature of destiny. This is a stone for feeling and understanding by way of intuition and emotions, instead of intellectual reasoning. It brings flashes of insight and helps you to apply intuitive impressions in a practical way. It seems to me that this would be very helpful to any person like me, who does psychic readings. 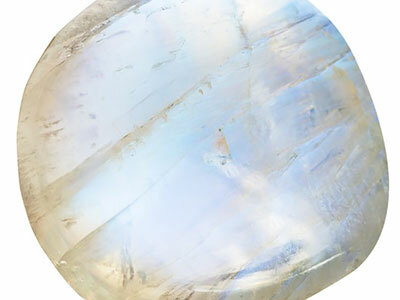 Moonstone traditionally is known to facilitate and heighten psychic abilities and it helps with clairvoyance. It is often worn as a pendant to help us accept our intuitive gifts. It also helps with discernment and allows you to make decisions which painlessly further your development. Moonstone also decreases emotional stress and helps with creativity and expression. Judy Hall’s book The Crystal Bible explains how Moonstone is known as the “stone of new beginnings.” Moonstone brings to our consciousness that which is unconscious and unknown to a person. It brings empathy. Moonstone helps with lucid dreaming, especially during the time of the Full Moon. Moonstone calms overreactions. It is passive and has feminine energy. It helps to balance male and female energies. It can especially help men who want to become more aware, and have more access to their feminine side. Melody makes an important note in her book: she reminds the reader to be careful that Moonstone does not bring about illusions in response to wishful thinking. Moonstone can also rid the chakras of negative energy. It enhances feminine aspects of a person’s nature, while one’s spirituality is being fed. It simulates confidence and composure. Moonstone teaches that there is no interpersonal situation that can’t be fixed with a little diplomacy. I have to be honest here, I really doubt that to be true regardless of what Moonstone teaches. Some situations are just really bad and we just have to get out. It is also interesting to note that, according to Melody, Moonstone enhances the environment in which it is kept. Crystal Vaults states that Moonstone opens the heart to love and care-taking qualities, as well as helping in the acceptance of love. This is great for new love or first love. It is a comforting talisman when love needs to kept be a secret. Love and eroticism belong to the Moonstone, as it stimulates Kundalini energy and “carnal desires.” It also helps with fertility and is named the “ultimate fertility crystal” on Crystal Vaults. Love is in the Earth by Melody (Earth-Love Publishing House, 1995) pgs 416 – 418. Their energy brings you into line with the cycles of nature, if you allow yourself to synchronize with these cycles. They aid you to release unnecessary clutter, and this refers to both physical and energetic clutter, caused by old emotional issues.